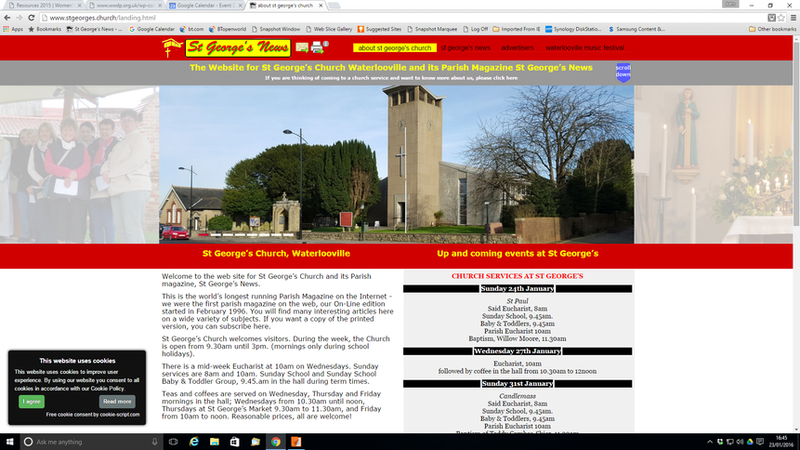 St George’s News was the world’s first parish magazine to publish on the Internet, the On-Line edition first appeared in February 1996, exactly twenty years ago. To mark this occasion the church and magazine website has been completely redesigned and re-launched. Take a look and explore all the information and resources that are available. It is fascinating to browse through past magazines going back decades, and remember long-forgotten distant events. You can read the latest Sunday Bulletin (and past ones), as well as PCC minutes and ACPM reports, there are discussion forums, a prayer board, somewhere to post rotas, and an up-to-date diary/calendar of coming parish events. Information about Church groups, the Hall, how to arrange a Baptism or Wedding, make a donation to the church, and much more - it’s all there!